de poppen zijn vintage in prima staat. renjishi "the theme of "renjishi" stays close to that of the nô play "shakkyô", and it is classified as a matsubame dance. That is, a dance that's performed before the symbolic backdrop of a large pine tree flanked by bamboo which is copied from the nô stage. This scenery has no connection with the dance's content. The first section features a pair of kyôgen actors who come to dance the story of the shishi parent and cub. 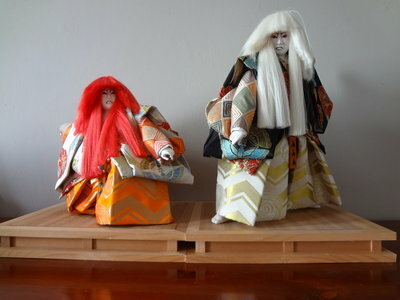 The actors each carry a wooden mask of a shishi head, one with white hair representing the parent shishi and the other with red hair to represent its child. A shishi is a mythological lion-like animal said to be the king of beasts and always associated with the buddhist deity monju. For this reason, any portrayal of the shishi should not only bring out its wild, beastial nature, but also a sense of dignity and authority that goes with this divine status. The shishi is in many ways a spiritual creature. The dance is set on a holy mountain in china called seiryôzan, among the towering peaks of which there is a miraculous stone bridge spanning a deep ravine. The bridge is a divine manifestation for on the other side is the buddhist paradise... The land where the deity monju dwells. The lyrics here are especially magnificent and describe the scenery with such graphic power that one feels truly awestruck. Through the dancers' movements too, the scenery come alive before our eyes. The highlight of this first section depicts the severe physical training the shishi cub must undergo at the hand of its parent. In order to foster courage and strength the parent kicks its young over the edge of the ravine and must wait anxiously to see if the cub can climb back up again. This is said to be a great test of the actor's abilities for he must portray fatherly love as well as a strict sense of discipline. After the two kyôgen actors withdraw down the hanamichi, we begin the second section of the dance which is a comic interlude called shuron ("religious debate"). This is patterned after the comic plays of the kyôgen theatre which are normally seen in the middle of nô plays. In this case, two priests who are on a pilgrimage to mt. Seiryô meet and begin arguing when they discover that they're from different buddhist sects. Eventually, both become frightened by the darkening skies and by the prospect of coming across the fierce shishi, and they run back down the mountain in a panic. To prepare us for the final scene, the nagauta musicians then begin a section of ôzatsuma music which is wonderful in its evocation of the grand mountain scenery. There is a short section of slow and gentle drum beats called tsuyu ("dew"), representing single drops of dew falling from the mountain peonies. Then, the spirits of the shishi pair enter. The shishi appear wearing the gorgeous brocade costumes that copy those of nô and also have the large trailing wigs made from real yak hair. Their final dance is one of celebration which also expresses the power of these "kings of beasts".